One of many of Mughal Emperor Shah Jahan’s monuments; the Jama Masjid mosque was his final architectural commission. 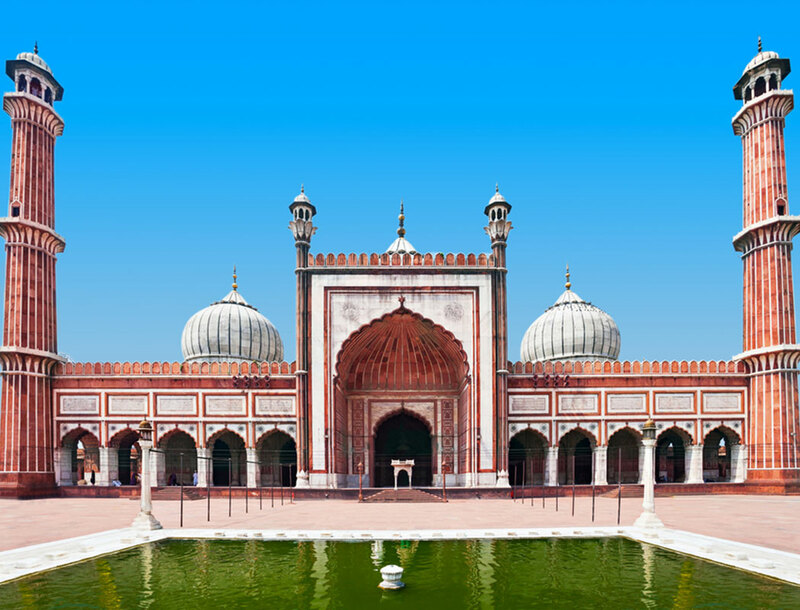 Most believe Jama Masjid is one of the largest mosques in India. The mosque is built from red sandstone and overlooks the Chawri Bazar in central Delhi. A prominent reminder of Mughal architecture; read on and discover the history of this famed monument…. Facing west, toward the holy city of Mecca, Saudi Arabia, the Jama Masjid is built on a stone platform. You can access the mosque via three flights of stairs, on the east, north and south. The eastern gate served as the Royal entrance and is only accessible on weekends. The largest interior space of the mosque is the prayer hall, accessible by eleven archways. The roof of the prayer hall comprises of three marble domes, one large dome in the centre with two smaller ones on either side. Each dome is topped with gold and covered with black and white marble stripes. The two 40m tall minarets on either side of the domes, are decorated with marble and red sandstone stripes. Inside each minaret there are 130 steps leading to the top, however only one is open to the public. You can enjoy panoramic views of Delhi from the top. Symbolising the ritual of baptism; the courtyard in front of the prayer hall features a square pool of water, used for washing hands, face and feet before entering the prayer hall. The courtyard itself, can fit up to 25,000 people and fills up every Friday at noon when people come to offer prayers. Commissioned in 1650AD by Emperor Shah Jahan, the Jama Masjid stands upon the Bho Jhala hill in Shahjahanabad (Old Delhi). The mosque required the efforts of over 5,000 chisellers, calligraphers, and other artisans. This magnificent piece of architecture took six years to complete. The main building materials of the mosque included red sandstone as well as plenty of black and white marble. It is estimated that Shah Jahan contributed 1 million rupees to build the mosque. However, this doesn’t include the contributions of construction materials and precious stones by many Nobles. Within the mosque there are many relics, and mausoleums. The eastern entrance used by royals and noblemen, leads to the central chamber as well as a mausoleum. The mausoleum holds the tombs of Sultan Ahmed Shah, his son Mohammed Shah II, and his grandson, Qutub-Ud-Din Ahmed Shah II. In the North Gate relics you can view include a Qur’anic chapter written on deerskin, strands of the Prophet Mohammed’s red beard, his sandals as well as an imprint of his foot on a marble block. The prayer hall in the western chamber has three domes on the roof and is accessible through the eleven archways. Mounted above the arches of these doorways you will find tablets of white marble inscribed with scriptures from the Qur’an. The floor of the mosque is finished with white and black marble in designs resembling Muslim prayer mats. Thin strips of marble define the 899 spaces for worshipers. The Jama Masjid is a must see for any tourist visiting Delhi. One of the best examples of Mughal architecture, entry to the mosque is free. However if you wish to take photos, a fee of 200 rupees applies. A holiday in India isn’t complete without a visit to its capital, Delhi; and a trip to Delhi isn’t complete without a visit to the Jama Masjid.